Many young people have asked me how to get ahead in life. I have lots of questions and few answers to most questions, but one thing has worked consistently for me. If you want to learn how to be very successful, you have to look at those who have achieved great things. Milo of Croton was a 6th-century BC wrestler who enjoyed a brilliant wrestling career and won many victories in the most important athletic festivals of ancient Greece. According to legend, he once carried a four-year-old bull on his shoulders before slaughtering, roasting, and devouring it in one day. Interestingly, he didn’t simply decide he was going to pick up a bull one day. He achieved the feat of lifting the bull by starting small and every day doing a little more. He started by lifting and carrying a newborn calf and repeating the feat daily as it grew to maturity. The calf didn’t change overnight, but there is a vast difference between picking up a newborn calf and a four year old bull. For many years, I was in terrible physical shape. I was working two jobs as I started Demotix, a photo newswire, and Variant Perception, a financial advisory firm, at the same time. I worked 7 days a week for about five years. I didn’t exercise and smoked, drank and didn’t get much sleep. A few years ago, I decided to get in shape, and for the first nine months, I was wasting my time. I’d come to the gym and rarely get tired, and I didn’t feel much better or even get much stronger. 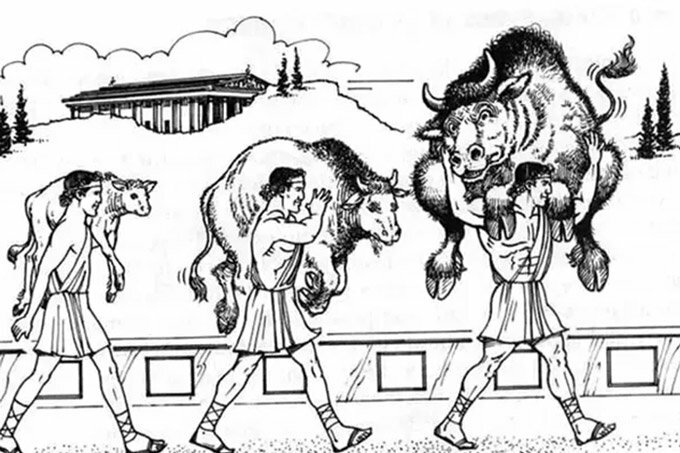 Then I read about Milo of Croton, and it changed the way I started working out. My trainer and I found a few simple exercises and set a goal to increase the weight 1 kilo every week for major exercises like bench press, dead lifts, or squats. This was extremely easy to do at first and on some weeks we could add more than one kilo. But after a while, it became difficult. Whenever I wanted to be lazy and lift the same amount I did the week before, I remembered Milo and added one kilo more. It worked. I only go to the gym twice a week for thirty minutes, and yet using this strategy, I can bench press over 300 pounds (I weigh 165 pounds). Every week I add more weight. I applied the same method to doing pull ups. I was terrible at first. My trainer and I set the goal to see how many pull ups we could do in half an hour. To give you a sense of how weak I was when I started, I’d struggle to do 30 strict pull ups. That is one pull up a minute. Utterly pathetic. I simply couldn’t do any more. Every single week we’d do one more pull up. They got much easier. Then we’d speed up the workouts. Today, I can do over 150 strict pull ups in 14 minutes, and my maximum in one go is 27. Every week I do more and faster. I also do 200 pushups every other day. I used the same technique. Every week, I went up by 10 push ups. How does this apply to learning or any other field? Warren Buffett reads all the time. Warren has said he reads 500 pages of financial material a week. That’s 100 pages per day. If you do that the whole year, you’re reading around 250 reports a year. If you keep that up, it is 2,500 annual reports every decade of your life. All that knowledge and learning adds up over time. The great comedian Jerry Seinfeld once told his secret for productivity to Brad Isaac. You can read about it on the great site Lifehacker. Figure out what it is that you really want to do, and use the Milo of Croton technique. Every day, lift one kilo more. Every day, read one more annual report. Every day, write one more joke. Every day write one page of the novel you’re working on. Whatever it is, I guarantee you, you’ll surprise yourself with the results.